Shortbreaks.com is dedicated to helping guests find great holiday destinations. It doesn’t handle bookings or take commission, and instead allows the guest to book direct with the property owner. At SCRUMPY we supply websites for holiday property owners and agencies. However, unlike a typical website or generic web builder, we offer a feature packed system with tools tailored to the self-catering industry. We provide what we feel is the perfect solution for promoting properties online - no matter the size of your business. From under one roof, we give our users the means to control the look and feel of their site, whilst automating time consuming tasks and making it easy to manage bookings. Our modern platform has already helped hundreds of small to medium sized businesses realise their full potential; whether that was to remove unnecessary paperwork, move away from commission charging travel agents or to reach max occupancy. A SCRUMPY website offers unrivalled search engine optimisation and has great exposure. Whilst our sites are very discoverable in their own right, we also provide you with the tools to further promote your properties yourself and we go the extra mile to additionally do this on your behalf. Shortbreaks.com is a growing collective of self-catering properties and holiday lets. It also happens to be SCRUMPY’s very own listing website, exclusive to the users of our platform. A listing is free, regardless of whether you are on a free Lite plan or use one of our paid services. We’re aware that getting seen online often means listing your accommodation in as many places as possible, but unfortunately this often costs you as a business owner. Whether this is a fee for you to be listed on a website or a commission that is taken from each enquiry or booking - a middleman is taking their slice of the service you provide. Unlike other pricing models, we like to give, not take. Shortbreaks.com doesn’t charge booking fees and doesn’t take commission, we simply let guests book directly with the owner instead. 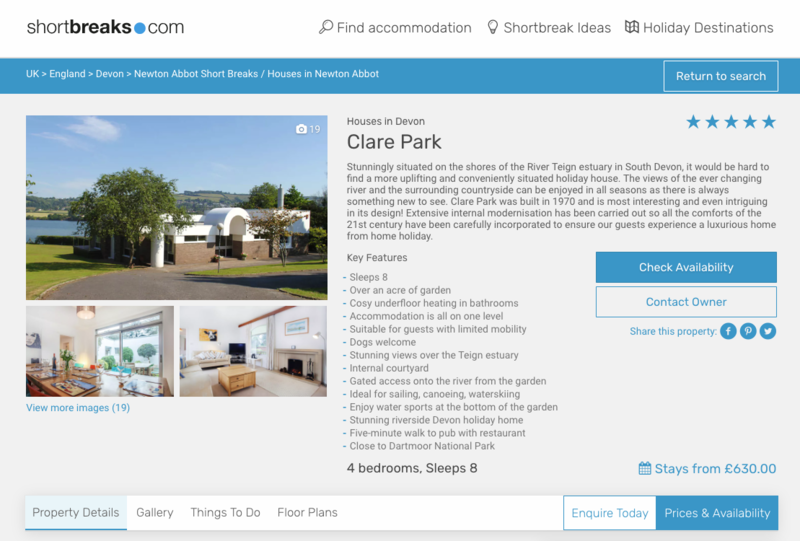 Each property listing on Shortbreaks.com is synced with the property profile on each SCRUMPY website. So the likes of descriptions, images and even the calendar, talk to one another; so when you update your own website, it also updates your listing. All methods give the guest the choice, removing any potential barriers. Whether they want to send a personal message to the owner, click through and explore that website further or simply book. The above all go directly to the owner, Shortbreaks.com is just a referral process. The booking process itself is actually a link to the owner's website’s checkout, offering a simple and fluent journey for your customers. Shortbreaks.com is part of SCRUMPY’s all in one solution. Every client who uses our website platform gets a free listing as an additional route to market. Think of SCRUMPY as your Diary, Calendar, Personal assistant and website all rolled into one - a central hub that can handle all your self-catering needs. 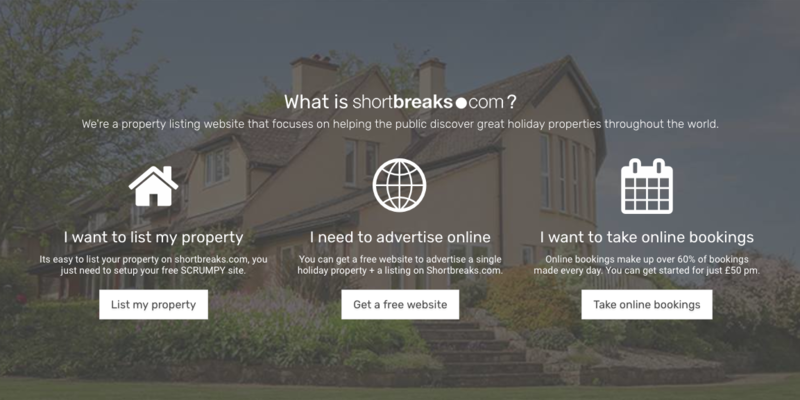 If you are interested in a new website for your holiday let and want a listing on the ever popular shortbreaks.com, then get in touch. We’re a small friendly team based in Somerset, feel free to give us a call on 01935 350022 or sign up here!